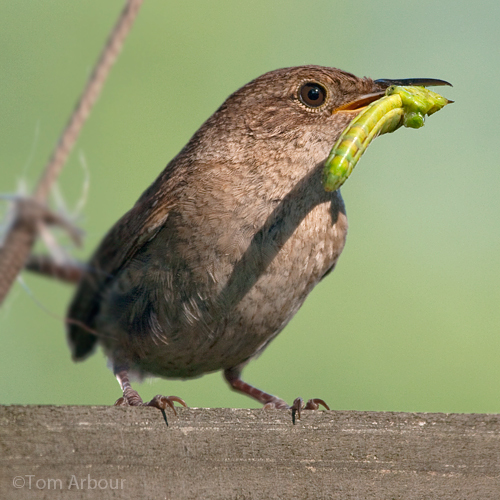 We've enjoyed the company of a family of house wrens the past three summers in our backyard. This year, the wrens moved in a little later- perhaps this pair had nested somewhere else earlier in the season. The chirps of the chicks kept getting louder as their mouths got bigger- so I just couldn't wait any longer to try to get a photo of their parents. House wrens may be small, but they're really interesting birds with plenty of interesting behaviors. One of the parents visits the nest box every few minutes, each time bringing their offspring some new food item that they captured in our neighborhood. They bring spiders, moths, caterpillars- anything that they can catch. In the hour or so that I watched and photographed them, this green prey item was by far the largest brought to the nest. I'm not exactly sure what it is- perhaps a grasshopper sans wings, head, and legs? Maybe a katydid? Yesterday evening I checked the nest box -and it was silent- the wrens had fledged. Hopefully we'll see them again next year.